After a year out of the HSA Championship (doing the Loton Championship and Toyota Sprint Series) I’ve returned with the ex-Laurence Marks’ Fiat Panda 100HP and it was good to see so many familiar faces in the paddock. This sprint was run jointly by the Bristol Motor Club and the Bristol Pegasus Motor Club and was round 11 in the HSA Championship. In the event on the day I was in a class of two with Llandow regular Rebekah Edwards in her VW Lupo, but in the HSA event I was in a class of two with Andrew Till in his MG ZR105. I came second in both classes but was quite happy with my performance, with a best time of 98.31 seconds over the one and three quarter lap course, which was faster than three of the MX5s in a big MX5 class. But first a brief video that I took at the start of the day to give an idea of the atmosphere for those who haven’t been to a sprint event. This was when we were waiting for the drivers briefing. Charlotte Phelps in her Westfield getting a push from her brother Adam while Dad, John, looks on. A very jovial Carole Nicholls in her Nike Formula Ford. This was the first time I’d met Carole but after my second timed run I headed off early to see my mother in Crickhowell and as I left there after a cup of tea I’m sure I saw the Nike on a trailer heading that way, so perhaps they are neighbours. Fyrth Cross getting ready for the off in his immaculate Ensign in which he set a new HSA class record of 80.69 for the Classic Racing Cars and Sports Racing Cars built before 1976 class. MX5s for as far as the eye can see. People say I change my cars a lot. How about Gordon Hick! Here he is in his new Ford Focus RS. I never did get to see his GT86 before he sold it. They had the gearbox out of this. I was dead impressed. Geoff Stallard in his Elan leaving a cloud of smoke at the start line. Paul Meadows in his Clio at the start line. Rebekah Edwards is beautifully colour coordinated with her Dora Motorsport VW Lupo. Rebekah won our class with a time 93.69. It wasn’t all plain sailing though. When Rebekah returned after her second practice run there was a lot of steam and smoke coming from the engine after the water housing exploded on the start line. Her team was quickly dispatched to Bridgend to get a part and they had it all back and fitted (and a new sets of wheels and tyres fitted too) with a minute to spare before the timed runs commenced after lunch. I don’t think she or her team stopped smiling throughout the whole thing – great team work. I should have brought my GT86 and added to the yellowness. Here’s Andrew Till in his MG. Andrew is comfortably leading my class in the HSA championship and is fifth overall. Here he is again, rounding the bus stop on three wheels. (My camera decided to malfunction so all these photos were taken with my phone, hence the poor quality of this one). Andrew Webber’s Lotus Elan +2 which is currently leading the HSA championship. 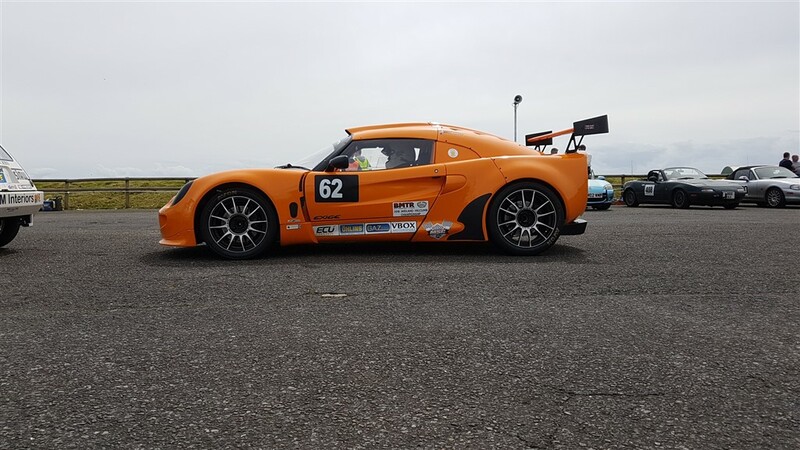 Paul Jones’s Exige. Paul was fastest in the Modified Series Production over 1800cc class with a time of 82.98. How didn’t I notice the helmet in front of Chris Howard-Harris’s face? Or did Lynn Gilbert put it there on purpose to steal the limelight? This is a better photo, taken by someone else and which I’ve ‘borrowed’ from the HSA Championship Facebook Group page. L-R: Charlotte and Adam Phelps, James Robertson, Lynn and Chris.